Replacement liner for AR Safety Scabbard. Designed specifically for AR15 and M16 Style rifles. To be contacted by Scabbard Technologies representative, please complete the brief form below. "My first encounter with the Safety Scabbard was on a quail hunting trip to Post, Texas. I was amazed at how well they held the guns and how easy it was to get the guns in and out of the scabbard! I started asking questions and was amazed to find out that they had them on their jeeps for over 8 years! AND I was really amazed when they swore to me that they had never had a gun fall out! I had to have some, so I went to work searching the internet and now have four, two on each of my UTV’s! I have a lot of friends involved in quail hunting who, when they see mine are making the switch from the metal, bulky, rusty junk they have now – TO THE SAFETY SCABBARD! I guarantee you can’t go wrong! Call me, I’ll let you know more." "My name is Eric Peterson and I am a member of the Margarita Gang. (a shooting group, not a drinking group) and we travel all of the US shooting sporting clays. I have had other gun holders on my cart. One day I was at a shoot in Baldwin Kansas and a Master class shooter had the scabbards on his cart. I asked him a lot of questions and his answer to every one was that this is the best gun holder made bar none! I called Randy on the phone and talked with him, I like the personal touch, and decided to order two. I've never regretted it. Anyone who has ever shoot sporting clays knows how rough some of the terrain and trails are. My guns have never slipped out or moved in my gun scabbards. I was at the Kansas state shoot a couple of years ago at Flint Oak and actually saw some one's Krieghoff fall out of their gun mount (not a scabbard) and hit the ground. "My group host a shoot ever year at Brunner Range and in the Past Randy has been one of our sponsors and the Scabbard is always chosen first over what ever other door prizes we have." "Randy and staff at Scabbard Technology have been very helpful and pleasant to do business with. When I ordered my Scabbard, they were very prompt in getting my order to me. They were very easy to install and work great in keeping my guns secure and safe, and keep from scratching the forearm and stock. I have recommended and will continue to do so to my fellow shooters. Thanks to Randy and staff. "My group host a shoot ever year at Brunner Range and in the Past Randy has been one of our sponsors and the Scabbard is always chosen first over what ever other door prizes we have." 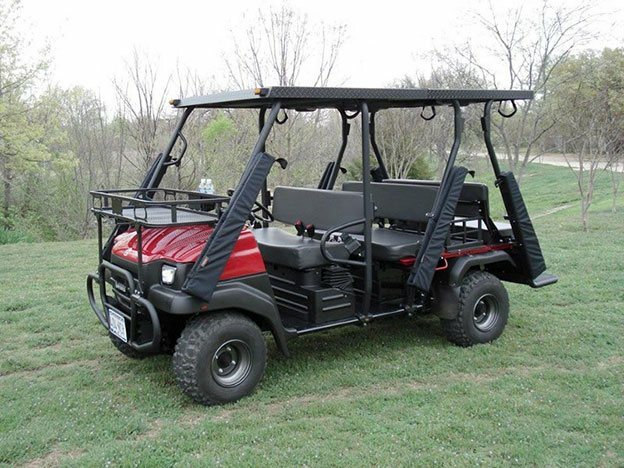 "We have our Safety Scabbards mounted on a 2008 EZGO. This has been the best gun holding device I have used. I have used the other product, the vertical rack available from golf cart suppliers and many other systems throughout the years. The Safety Scabbard allows you to install and remove the gun repeatedly without banging it into clumsy mounting systems and causing nicks and dings. The thick padding protects your gun and holds it secure. Best of all the Safety Scabbard looks great on our EZGO." "Somewhere around 2004 my better half purchased a pair of gun scabbards & a floor mount for our E‐Z Go golf cart. We used them in that cart until 2 years ago when I moved them to a new E‐Z Go. We have been 110% satisfied with our Scabbards. They have held our guns securely while traversing clays courses all across the Midwest. The ease of putting guns into and removing them along with them being under the roof keeping them out of the rain & sun are two of greatest benefits of our Scabbards. Other than the black covers fading slightly from the sun, they are still good as new. We often shoot small bore competitions & need to carry extra guns or barrels, so I did a little remodeling of the floor mount and now have 4 scabbards side by side in that cart. I just ordered 2 more scabbards & another floor mount for a 2nd cart we are going to leave at our local course. In the 15 + years we have been shooting clays we have seen every imaginable type of gun carrying device, but none that I would trade my Scabbards for. I am looking forward to receiving my new set of Scabbards." © 2019 Scabbard Technology LLC. All Rights Reserved.